This is the continuation of the first part of my gear suggestion post, here. After looking at a few options, Osprey seemed like a winner because of the complete vertical ‘stem’ that protects the hydration pack from direct pressure inside the backpack. In addition to this, the stem also serves as a great handle to hold the hydration pack while filling it, either from a tap or by pouring water in it from a bottle. The pack comes in 2 litre and 3 litre versions, although the price difference isn’t significant. In my opinion buying the 3 litre version and filling up the required amount of water is the way to go. Hydration pack is one of those things which I thought I could get by without, until I used it. I’ve started drinking a lot more water while hiking / climbing than I used to earlier, when I had to stop, pull out a bottle, take a gulp and stuff the bottle back in the pack (even if it were in the side pocket without taking my pack off). Whether you are on a big mountain with a long summit day or camping for multiple days with short out-and-back hikes nearby, a day pack is incredibly convenient. 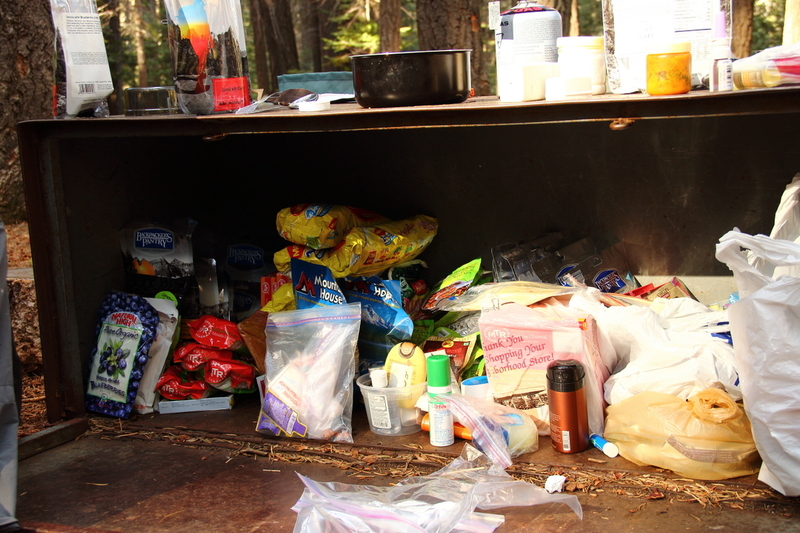 Not only can you leave all your stuff in your main pack at camp but also carry a much lighter and more compact pack with just the bare essentials. For a day pack, I’ve found 15-18 litre capacity to be the golden mean between lightweight and spacious enough, specially if this is your secondary pack. A good feature to look out for is a hip belt with a couple of small pouches to stash those bars and energy gels for gruelling summit days! In headlamps, there is a dizzying array of options, with features such as built-in charger (USB based). However, that particular feature probably wouldn’t appeal to many users, since you can always use rechargeable batteries anyway and charge them faster using an external charger. The Storm is waterproof, an important feature that many of the lower models only partly satisfy. It also features four batteries, instead of the usual three. With a super bright light, the usual side lights and strobe function plus a red light feature (to preserve night vision / comfortable use inside a tent while preserving battery), the BD Storm is an amazing headlamp indeed! This entry was posted in Hiking / trekking, Mountaineering and tagged Black Diamond Storm, gear, headlamp, hydration pack, Osprey, REI Flash on July 12, 2015 by abhi. Anyhow, since I’ve saved myself that, let me get to the point – ‘good gear’. For a long time I’ve been frugal skimping on buying good gear, often with the attitude of roughing it out. And roughing it out is good but only so much. If you’re hiking a small hill nearby, or out on a trail for a few hours, surely you don’t need a down jacket or expensive Gore-Tex clad boots, normally. Then you’re doing multi-day backpacking trips, climbing a little more involved peaks, maybe spending long hours in the snow…Now you need to upgrade! What piece of gear and how much to upgrade?? Of course, that depends on a lot of things, mostly how committed you are to the activity and how much comfort / value addition is that upgrade going to be in the overall experience. If you don’t mind splurging all at once, you can always just go ahead and buy the best gear right away. I personally upgraded different pieces as I felt most pressed and definitely appreciate all the good gear much more, now that I can clearly experience the difference! shiny (or not so?!) gear… The gear listed below isn’t top of the line in its category but as always, top of the line is easy to pick; getting a great value for money with a mid-range option is the tricky part. Boots are arguably the most important piece of gear on a mountain and I’m extremely happy with these! As promised, they’ve held up perfectly well in hours of continuous climbing in the snow, keeping my feet dry and warm. Although they don’t have significant insulation, for peaks in the Cascades, like Baker, Adams and Rainier, these boots are more than sufficient with a good pair of socks. They have a heel welt, making crampon attachment a breeze. There are boots with both heel and toe welts but unless you’re planning on doing some serious ice climbing, you would be better off with these. Sure, you can spend upwards of $100 on ‘branded’ soft shell pants but these generic ones on eBay work amazingly well too, for less than half the price! As long as you’re wearing a decent layer inside (which you probably will regardless) you should be good. I’ve climbed in these in the snow without any long base layer and am perfectly happy. Plus they come with zips on the thighs (at the sides) to provide ventilation while hiking on a hot day, which is very much welcome. Other jackets in similar range are the Patagonia Nanopuff (synthetic, NOT down) and Patagonia Down jackets (although the one in similar price range doesn’t have a hood and the one which has a hood is more expensive plus it has only 600 fill vs Sierra Designs’ 800 fill). This is an extremely light, waterproof jacket from Marmot and packs small too. This jacket combined with a down jacket inside is a very robust package of warmth and wind/rain/snow protection. Plus, when it’s too warm to wear a puffy, you can simply throw this over your base layer for a comfortable wind protection layer. More gear advice in the next post. This entry was posted in Hiking / trekking, Mountaineering and tagged Black Diamond, Charmoz, crampons, Crocodile, down jacket, gaiters, gear, Marmot, mountaineering boots, Outdoor Research, PreCip, rain jacket, Sabretooth, Scarpa, Serac, soft shell on July 8, 2015 by abhi. Pyramid Peak, just shy of 10k feet, is a great day hike and can serve as a good training hike to stay fit for bigger hikes / climbs. Named after its rather obvious shape, it is one of Tahoe’s most prominent landmarks. The standard summer trail gains ~4k feet of elevation, which can become a strenuous hike at some spots and overall a little exhausting, if not in good shape. 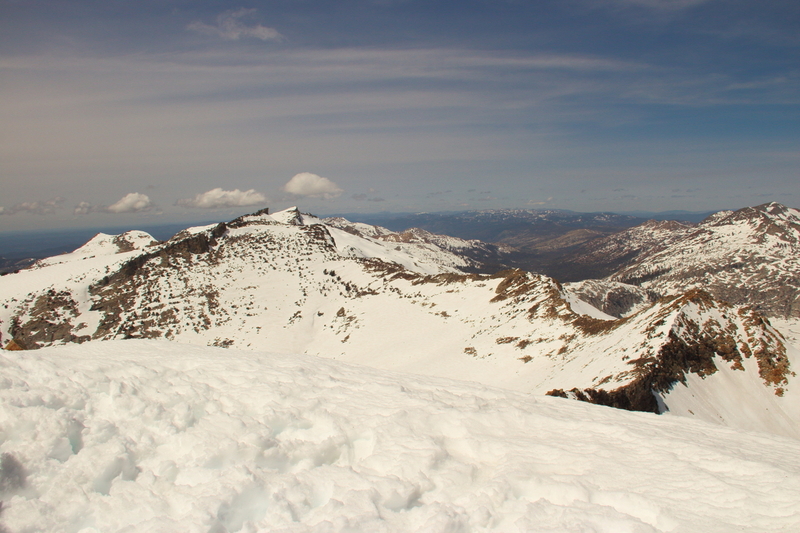 In mid-May there was still a lot of snow above the treeline and snowshoes and gaiters were pretty much unquestionable. The scree and boulder section leading to the summit is constantly swept by strong gusts, which is also why all the snow was blown off the slope in this portion during our hike. At times we were holding on to boulders to stabilize ourselves in the wind – I genuinely felt I could have tipped over on certain occasions! We reached the top in about four hours, with only few real breaks in between. After munching down the much needed calories, we headed back down. 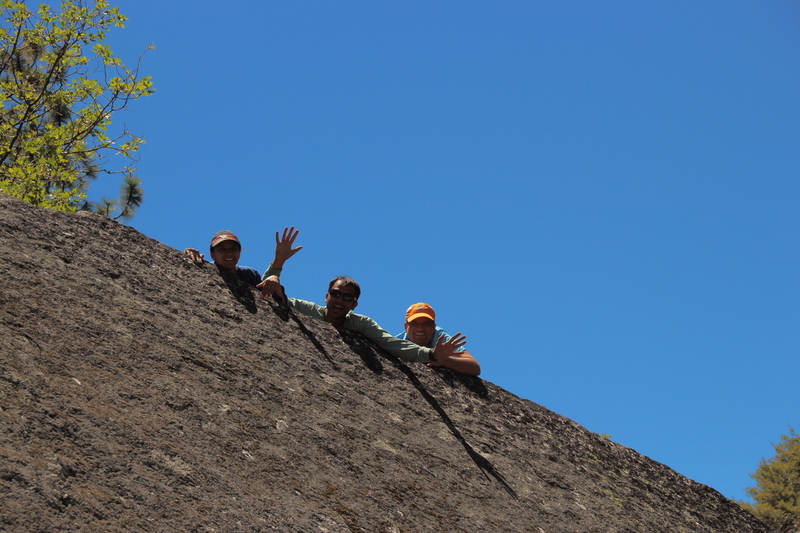 This entry was posted in Hiking / trekking and tagged hiking, Pyramid Peak, Tahoe on July 9, 2014 by abhi. 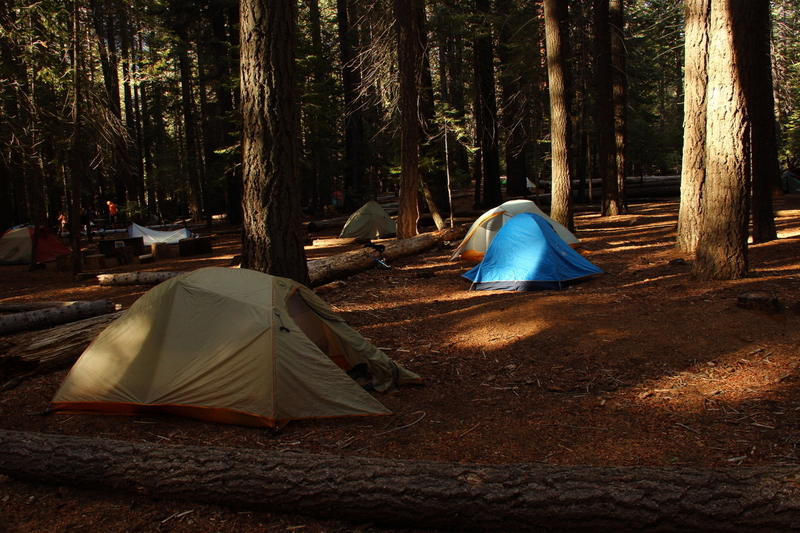 This past weekend, a bunch of close friends and I went to Yosemite for a camping / hiking trip. Being a holiday weekend, there was the expected rush of visitors and backpackers; so much that the roads leading to the valley were jam packed at places! Although once we parked and started hiking, the crowds seemed to disperse and dissolve into the huge expanse of the park. 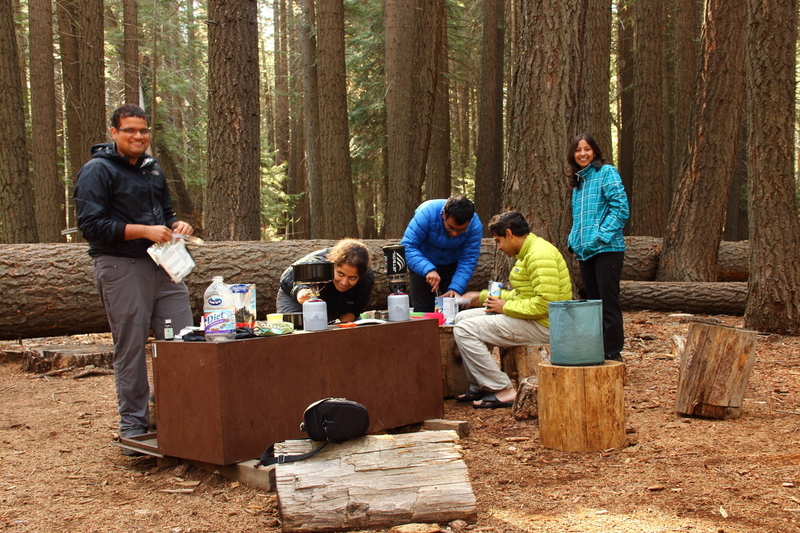 After sorting out our camping and hiking permits, parking our cars and having a good lunch at a pizza place in Curry Village, we were on the trail heading toward Little Yosemite Valley, or LYV. This would be our camp for the remainder of our trip. We reached the campground just before dusk, after a good 4 mile (6.4 km) hike with about 2000 ft (600 m) elevation gain. Among the infinite thoughts that came and went from my mind was why humans hadn’t evolved some sort of autotrophic ability… that surely would’ve saved us a hell lot of effort carrying tonnes of food on such hikes! 🙂 Apart from random crazy thoughts, the Mist Trail that we took lent us some beautiful views of the valley and waterfalls. No Californian voodoo here! 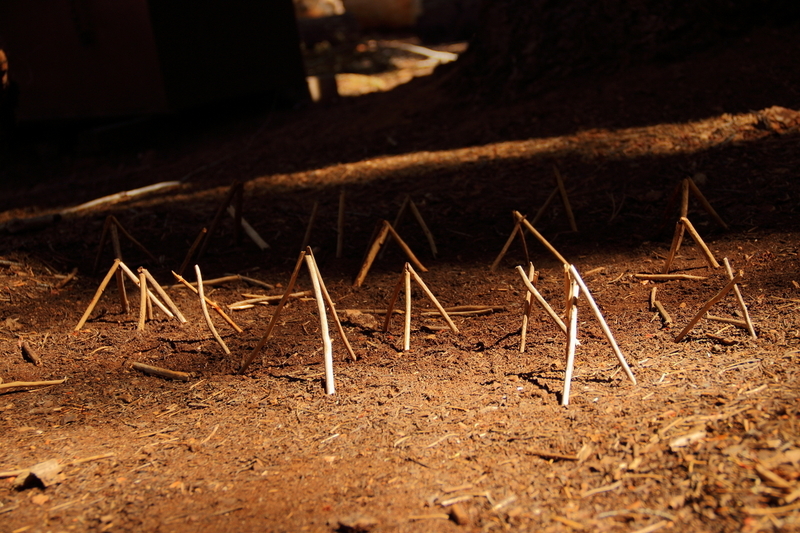 Backpackers often keep such delicately inserted twigs in the ground near food lockers to see later if a bear (or other animal) had visited in their absence. With light day packs of lunch and water, we headed out for Half Dome the next morning, after a hearty breakfast of course! 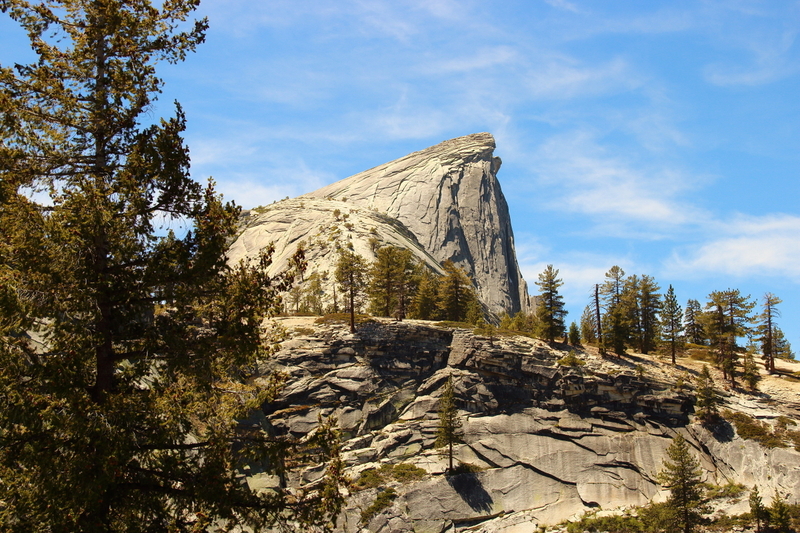 The hike to Half dome is around 3.5 miles (5.6 km), with an elevation gain of around 2700 ft (820 m), up to the top of the dome, including a vertical accent in the end. For majority of the hike from LYV, Half Dome remains hidden, before appearing quite majestically and unexpectedly for the first timer. As we got to the base of the sub-dome, a ranger checked our permit and gave us the required brief safety info for climbing the last vertical section. The last 400 vertical feet (120 m) are fixed with cables anchored at the top and bottom, which are used to pull on, while keeping a grip on the granite below your feet. Honestly, it looks crazy dangerous from far and doable-but-scary once you’re at it! There are planks in between to support your feet and take a small rest but at no point can you really let go of the cables! 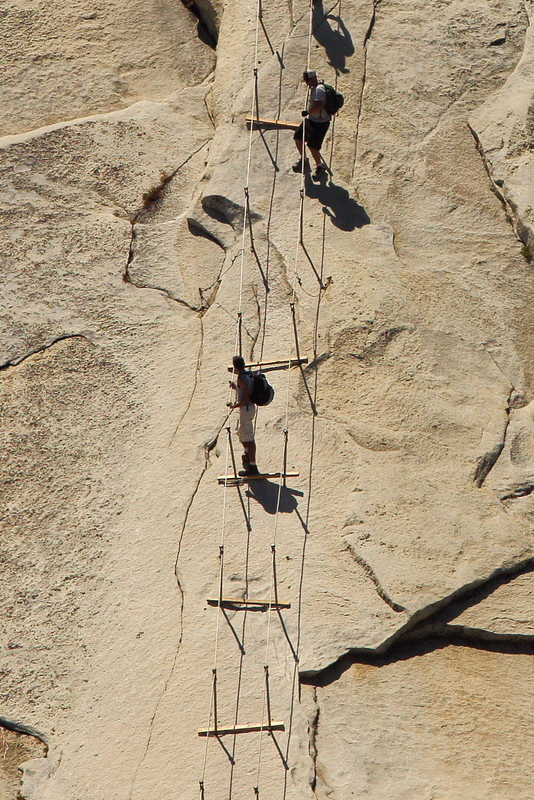 Although it seems like a ladder, it is far from that – there is quite a bit of distance to ‘walk’ up the rock in between two successive planks. Any slip / fall through the vertical posts would almost certainly result in a slide all the way off the rock! 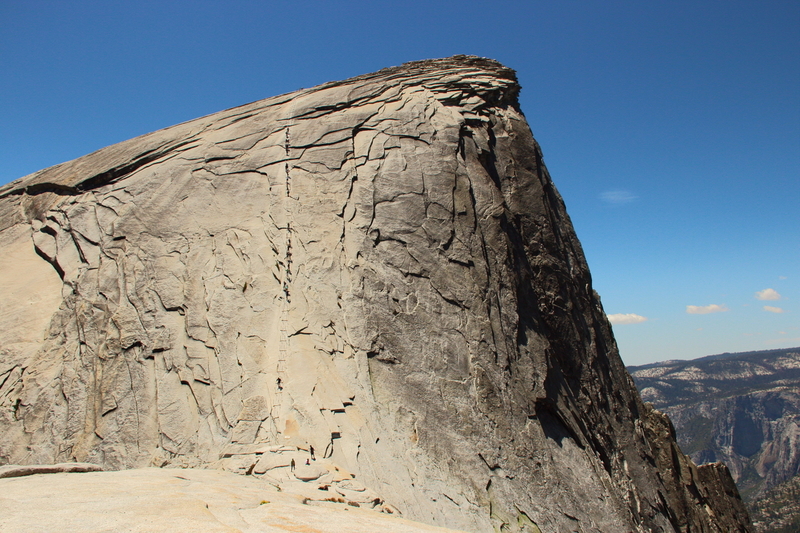 And according to the National Park Service, people have indeed died climbing half dome. Having said that, I personally never felt a life threatening fear while climbing up the cables and scores of people climb up the cables every season. The cables themselves feel extremely sturdy and provide all the assurance you need, and then some more! In the end, part of the thrill is feeling a certain degree of fear and the Half Dome lives up to it! 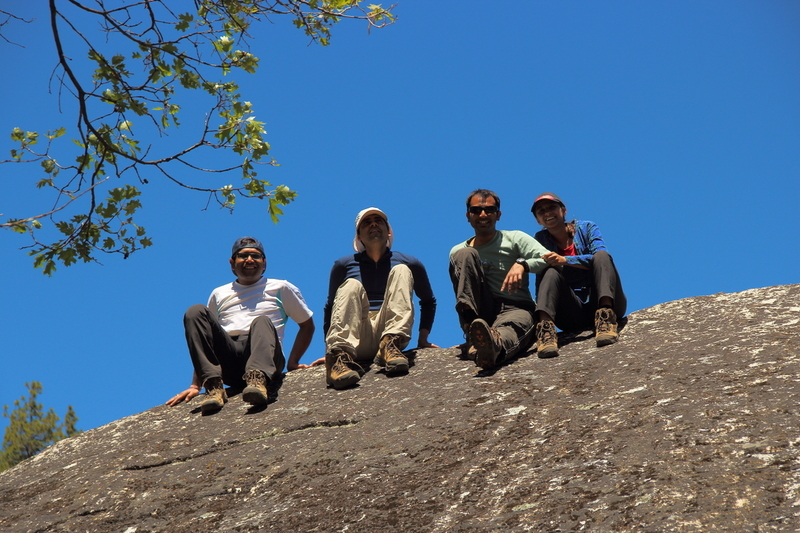 All of us decided to make a rest day of the next day and laze around and hike to a nearby place. 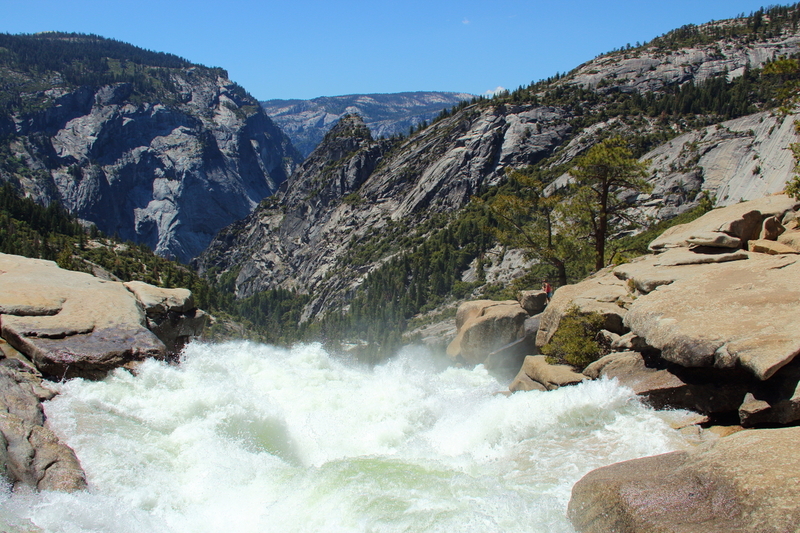 The river near campsite was refreshing in the morning and during the day we hiked to the nearby Nevada Falls. On Tuesday Neha and I returned back to the city and the rest of the guys left camp in the morning to hike up Cloud’s Rest. Both of us wish we could have stayed longer and gone up this spectacular summit (as described by the guys later), just shy of 10,000 ft.
Just recollecting the whole experience makes me want to go back to the valley again soon! Unwinding in nature’s lap, in the company of people you love… what better way to rejuvenate?! 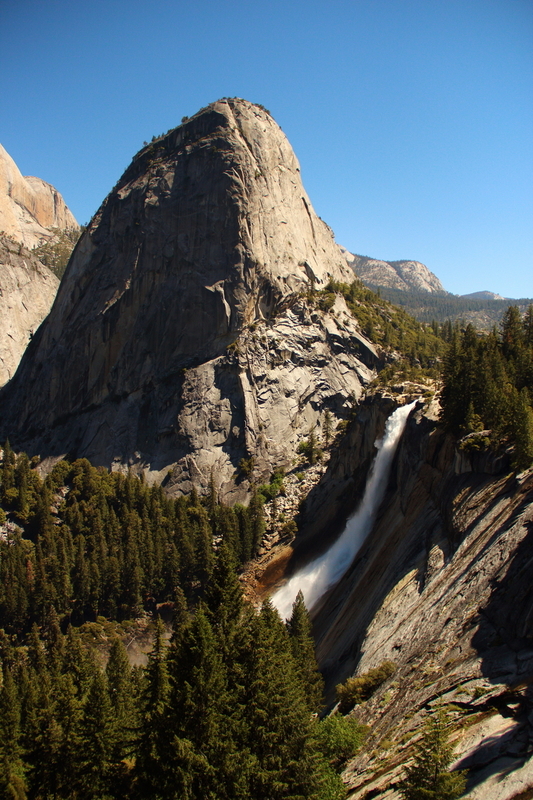 This entry was posted in Hiking / trekking and tagged camping, Half Dome, hiking, Little Yosemite Valley, Nevada Falls, Yosemite on May 31, 2014 by abhi. Since moving to the Bay Area recently, I’ve been craving to go on a good climb, preferably a snow-covered peak. And so after making-and-breaking plans for Mt. Shasta (a very famous 14er in this region) because of crazy weather week after week, one of the hikers from that group, Tomoko, came up with a day-hike plan for Round Top Peak. After trying to get some other folks on board this plan, finally it was just the two of us on a Saturday morning, headed off to climb in the snow! 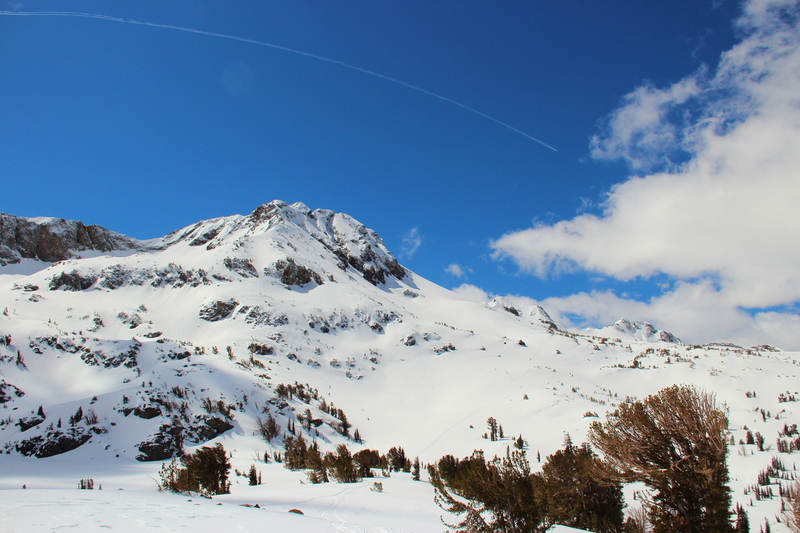 This entry was posted in Hiking / trekking and tagged hiking, Round Top Peak, winter ascent on April 13, 2014 by abhi. Rolling hills make for a great bike workout! This was a very leisurely and sunny ride – rather too hot by afternoon! This entry was posted in Biking and tagged biking, Keep Vincennes Rolling on December 7, 2013 by abhi. Collage of pics from an epic annual night ride, called ‘Navigate Indy This Evening’, or NITE. It starts and ends at IUPUI’s stadium and is typically around 20 miles. The ride begins around 11 pm and there is dinner afterwards – pretty good pasta and fruits! 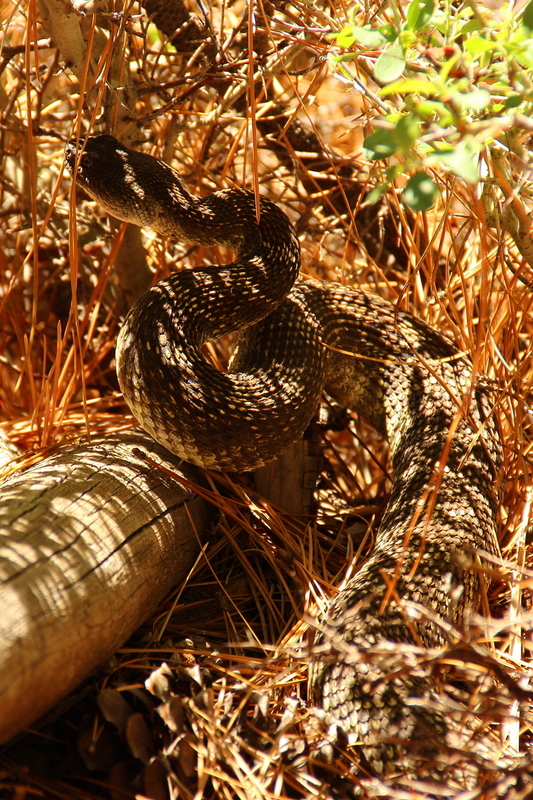 There is also an afternoon ride earlier in the day. This entry was posted in Biking and tagged biking, Navigate Indy This Evening, NITE on December 7, 2013 by abhi. An adventure-seeker, eager for new and exciting experiences. Climbing mountains, photography and travelling to new places are some of the things I would pick in a heartbeat instead of partying in the city! I would love to connect with like-minded people (i.e. crazy in a good way!) and share our experiences / cook up some plan together!